Okay! Musume Time: For the Love of Idols! Early Merry Christmas! As I write this, I am listening to the Douyo Pops version of White Christmas, happily trying to sing along and failing as I think about how quickly December has come along, and just how much Idols make me question my sexuality. Oh, and also, Happy 100th Post! And Happy 10,000+ views! I recently hit that mark, and thought that I should dedicate my 100th post to something I love very much - Idols and Kusumi Koharu. So, what's going to happen in this post? Well, me blabbering on about why I love Idols, or something along those lines. I love Idols! It's only been about 2-3 years since I found out about the Idol industry, but since then, I have really started to appreciate them and even fall in love with them. And because of this, I have found that I have begun to question my sexuality. Am I sexually driven towards girls, or is it just Idols tricking me with their gorgeous bodies, their cute faces and their overall sexual appeal? Maybe it's both, I don't know. However, I do know for a fact that I love Idols! Right now, they're the reason I get through my day. Listening to their music makes me happy, hearing about new songs that they're coming out with makes me ecstatic and gives me a reason to look forward to something whilst just watching videos of them gives me enjoyment and ultimate happiness (depending if the PV is good or not). But recently, I have found myself analysing these videos more as well as the groups. 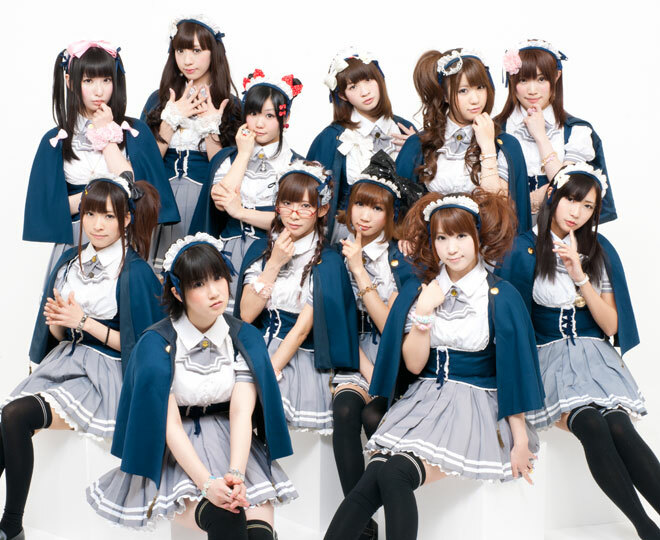 If you look back at my post on Afilia Saga East and how naughty they really are, you will see that I took an analytical point of view on the Maid café based group, who cater to the fetishes of their fanbase, not just with their maid costumes, but also with other sorts of fetishes such as their swimming costumes and school skirts. But I guess, to some degree, all female Idol groups try to cater to the fetish at least once - especially school girl outfits. I mean, how many times has AKB48 worn a school girl outfit? What about Morning Musume? And don't forget new-to-the-scene group Ebichu and Sakura Gakuin. Though seemingly innocent, these two groups also cater to that school-girl fetish that Japan is so well-known for. Yes, they may seem cute and fluffy, but secretly they're reaching for the pockets of the perverted men who are secretly obsessed with the school girls uniform. But even with these fetishes that surround Japan's Idol industry, I still adore the girls just as much as any other person. Just because they cater to mostly men who like how young they look, or for what they wear, it doesn't really deteer me in any way, much like it won't deteer any of you. I guess it's how risqué Idols can get that makes me admire them so much more. I mean, they don't get so risqué (unless it's AKB or Afilia Saga, of course) that it becomes illegal or downright slutty - they are just risqué enough to satisfy our taste buds, and it's the amount of risk they take that makes them sales. In all honesty, I don't think I could live without girl groups if they didn't have a uniform in at least one PV - I've become accustomed to school girl outfits in PVs, as well as seeing the girls in one form of uniform. Using PASSPO as an example, I am used to seeing the girls in their flight attendant attire. If they were to stop wearing it, I would cry. Their theme would be ruined, in my eyes, and I would probably stop watching them. I mean, it was the concept of the group that made me start liking them. But I guess what I like the most about girl groups and Idols is how fun these girls can be - their videos can be random, or downright depression, but overall the girls themselves are very fun and cute. Okay, it might just be an act for the camera, but who cares? When I am watching these girls perform on stage, or watch them walk around as they film each other, I find that I fall in love with the girls more and more. I love to see how they shine with each other, and it's wonderful to see how close they can be. When I watched Takahashi Ai with Niigaki, it was really sweet. When I see Sayumi with Eri, it makes my heart ache to know that they're not together anymore, but it makes me happy to know how close the two girls were. I love watching as these girls shine and show their individual personalities in front of the camera. One who I especially love right now is Ikuta Erina. Just watching her as she fawns of Maeda Yuuka is both funny and admirable. She's basically a Wota born as an Idol. Her fangirlishness just reminds me of what I am, and it makes me really happy to see that in Eripon. Cute as a freakin' button! Back in 2009, I was really into anime and would watch it religiously. Nothing could come before anime back then, especially Mermaid Melody or Tokyo Mew Mew. I wasn't really interested in anything else, aged 15 back then, until I came across a really cute anime that had catchy songs called Kirarin Revolution. I thought it was wonderful, and watched a few of the episodes before I started to look for the songs. I then found out who the singer was, a girl named Kusumi Koharu. I was hooked on this singer, and before I knew it, I was looking her up and found out that she was from this group called Morning Musume. Surprisingly, I had heard of one of their songs before actually getting into the group. Go Girl! Koi no Victory was my first true experience of this group, however I had hated the song at first. However, I soon fell in love with the group in August of 2009, thanks to Kusumi Koharu. She became one of my very first girl crushes, and has since been my all time Idol obsession because of what she has introduced me to. However my hopes and dreams were crushed when I learned of her graduation just a few weeks after becoming a fan of the girl. I was still getting used to Morning Musume at the time, and I was so besotted by Koharu that I was both angry and shocked. I don't think I knew what to do, but with the knowledge that Morning Musume had a history of graduations, I just got on with it and enjoyed Koharu for the amount of time she had left in the group. Luckily, I was falling in love with Morning Musume more and more as I looked through their past singles before Kimagure Princess came out. Then she graduated. To this day, Nine Smile is the only concert I have watched fully. I have never cared about a Morning Musume member as much as Koharu. Even now, I still cry when I see her walk back onto the stage to yell to her fans. I even watched a part of the backstage video, and when she walked onto that stage to yell to the crowds of fans, I cried a little bit. Even though I only knew of her for about three months before she left the group I still idolise today, Koharu was a big part of my early Wota days. She is the reason why I became a fan of Idols, and she is the reason that I am here right now. Koharu is the Idol that I will always love and look up to, and even now, I try my best to keep up to date with what she's doing. Because of her, I have fallen in love with Morning Musume and Idols all together. The reason I got into Idols, and the reason why I am now a wota. Koharu is the one who lead me to Wota blogs, such as Janakya Mottanai, Pink Wota and even Selective Hearing. She's the reason why I am who I am now, and even today, I bow down to her.